Home Permaculture What is Permaculture? "Permaculture is a design system which aims to create sustainable human habitats by following nature's patterns. " I guess I would know more about permaculture than most people, and I can't define it. ... I'm certain I don't know what permaculture is. Nevertheless, today permaculture can best be described as an ethical design system applicable to food production and land use, as well as community building. It seeks the creation of rich and sustainable ways of living by integrating ecology, landscape, organic gardening, architecture and agroforestry. The focus is not on these elements themselves, but rather on the relationships created among them by the way they are placed together; the whole becomming greater than the sum of its parts. Permaculture is also about careful and contemplative observation of nature and natural systems, and of recognizing universal patterns and principles, then learning to apply these ‘ecological truisms’ to one’s own circumstances. In the mid 1970s, two Australians, Dr. Bill Mollison and David Holmgren, started to develop ideas that they hoped could be used to create stable agricultural systems. This was a result of their perception of a rapidly growing use of destructive,industrial-agricultural methods. They felt these methods were poisoning the land and water, reducing biodiversity, and removing billions of tons of soil from previously fertile landscapes. A design approach called 'permaculture' was their response and was first made public with the publication of Permaculture One in 1978. The term permaculture initially ment "permanant agriculture" but this was quickly expanded to also stand for "permanent culture" as it was seen that social aspects were an integral part of a truely sustainable system. Mollison and Holmgren are widely considered to be the co-originators of the modern permaculture concept. After the publication of Permaculture One, Mollison and Holmgren further refined and developed their ideas by designing hundreds of permaculture sites and organizing this information into more detailed books. Mollison lectured in over eighty countries and his two-week Design Course was taught to many hundreds of students. By the early 1980s, the concept had moved on from being predominantly about the design of agricultural systems towards being a more fully holistic design process for creating sustainable human habitats. By the mid 1980s, many of the students had become successful practitioners and had themselves begun teaching the techniques they had learned. In a short period of time permaculture groups, projects, associations, and institutes were established in over one hundred countries. Permaculture has developed from its origins. English permaculture teacher Patrick Whitefield, author of The Earth Care Manual and Permaculture in a Nutshell, suggests that there are now two strands of permaculture: a) Original and b) Design Permaculture. Original permaculture attempts to closely replicate nature by developing edible ecosystems which closely resemble their wild counterparts. Design permaculture takes the working connections at use in an ecosystem and uses this as its basis. The end result may not look as "natural" as a forest garden, but still has an underlying design based on ecological principles. Today permaculture is an international movement that seeks to address environmental and social problems through the application of intelligent design. The term 'Permanent agriculture' was first coined by Franklin Hiram King in his classic book from 1911, Farmers of Forty Centuries: Or Permanent Agriculture in China, Korea and Japan. In this context permanent agriculture is understood as agriculture that can be sustained indefinitely. This definition was supported by Australian P.A.Yeomans (Water for Every Farm, 1973) who introduced an observation based approach to land use in Australia in the 1940's, based partially on his understanding of geology. Yeoman introduced Keyline Design as a way of managing the water suply of a site. The work of Howard T. Odum was also an early influence especially for Holmgren. Odum's work focus on system ecology, in particular the Maximum power principle which examined the energy of a system and how natural systems tend to maximise the energy embodied in a system. For example the total calorific value of woodland is very high with its multitude of plants and animals. It is an efficient converter of sunlight to biomass. A wheetfield on the other hand has much less total energy and often requires a large energy input in terms of fertiliser. Earthcare – recognising that the Earth is the source of all life (and is possibly itself a living entity- see Gaia theory) and respecting her accordingly. Peoplecare – supporting and helping each other to change to ways of living that are not harming ourselves or the planet, and realizing that we are a part of the Earth, not apart from it. Fairshares (or placing limits to consumption) - ensuring that the Earth's limited resources are utilized in ways that are equitable and wise. Everyone needs to eat, and it is the issue of food production where permaculture had its origins. It started with the belief that for people to feed themselves sustainably they need to move away from reliance on industrialized agriculture. Where modern farms used fossil fuel driven technology specialising in each farm producing high yields of a single crop, permaculture would stress the value of low-inputs into the land and diversity in terms of what was grown. The model for this was an abundance of small scale market and home gardens for food production. The core of permaculture has always been in supplying a design toolkit for human habitation. This toolkit helps the designer to model a final design based on an observation of how ecosystems themselves interact. A designer observes how the many different parts of an ecosystem interact. A simple example of this is how the Sun interacts with a plant by providing it with energy to grow. This plant may then be pollinated by bees or eaten by deer. These may diperse seed to allow other plants to grow into a tall tree and provide shelter to these creatures from the wind. The bees may provide food for birds and the trees provide roosting for them. The tree's leaves will fall and rot, providing food for small insects and fungus. There will be a web of intricate connections that allow a diverse population of plantlife and animals to survive by giving them food and shelter. One of the innovations of permaculture design was to appreciate the efficiency and productivity of natural ecosystems and seek to apply this the way human needs for food and shelter are met. One of the most notable proponents of this design system has been David Holmgren, who based much of his permaculture innovation on zone analysis. Observation of a site is an important part of permaculture design. Some people recomend a year long observation of a site before anything is planted. During this period all factors, such as lay of the land, natural flora, can be brought into the design. A year allows the site to be observed through all seasons. Observation is the first stage in the O'BREDIM design methodology: Observation, Boundaries, Resources, Evaluation, Design, Implementation, Maintenance. The use of patterns both in nature and reusable patterns from other sites is often key to permaculture design. This echos the Pattern language of Christopher Alexander used in architecture which has been an inspiration for many permaculture designers. Permaculture Zone classifies three dimensional geographical areas according to the amount of human attention needed to maintain the sustainable function of the zones. Zone 0 is the home; Zone 1, the yard; Zone 2, the vegetable garden; Zone 3, perennial crops; Zone 4, orchards and Zone 5, wilderness. (The zones do not have to be these things exactly). Thus, things in Zone 1 will need to be visited more often than those in Zone 3, so Zone 1 will be closer to the home, continuing out to wilderness which should need minimal attention. Also key to the Permacultural design model is that useful connections are made between components in the final design. The formal analogy for this is a natural mature ecosystem. So, in much the same way as there are useful connnections between Sun, plants, insects and soil there will be useful connecions between different plants and their realtionship to the landscape and humans. 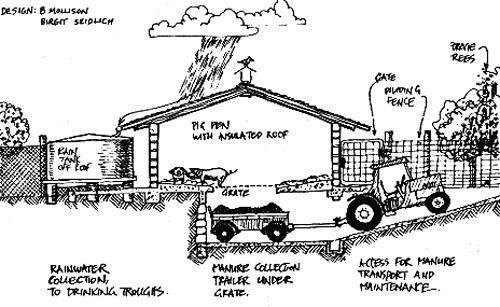 Another innovation of the permaculture design is to design a landuse or other system that has multiple outputs. In terms of Holmgren's application of H.T.Odum's work, a useful connection is viewed as one that maximises power: that is, maximizes the rate of useful energy transformation. A comparison which illustrates this is between a wheat field and a forest. A mature ecosystem such as ancient woodland has a huge number of relationships between its component parts: trees, understory, ground cover, soil, fungi, insects and other animals. Plants grow at different heights. This allows a diverse community of life to grow in a relatively small space. Plants come into leaf and fruit at different times of year. For example, in the UK, wild garlic comes into leaf on the woodland floor in the time before the top canopy re-appears with the spring. A wood suffers very little soil erosion as there are always roots in the soil. It offers a habitat to a wide variety of animal life which the plants rely on for pollination and seed distribution. The productivity of such a forest in terms of how much new growth it produces exceeds the most productive wheat field. It is in this observation of how more productive a wood may be on far less input of fertilizers that the potential productivity of a permaculture design is modelled. The many connections in a wood contribute together to a proliferation of opportunities for amplifier feedbacks to evolve that in turn maximise power flow through the system. In permaculture and forest gardening, seven layers are identified: The canopy; secondary trees; shrubs; Herbaceous layer; ground cover plants; root crops and climbers. Alley cropping is a simplification of the layered system which typically uses just two layers, with alternate rows of trees and smaller plants. Permaculture Guilds are groups of plants which work particularly well together. These can be those observed in nature such as the White Oak guild which centers on the White Oak tree and includes 10 other plants. Native communities can be adapted by substitution of plants more suitable for mans use. The Three Sisters of maize, squash and beans is a well know guild. The National Vegetation Classification provides a comprehensive list of plant communities in the UK. Guilds can thought of as an extension of companion planting. Perennial plants are often used in permaculture design. As they do not need to be planted every year they require less maintanance and fertilisers. The are especially important in the outer zones and in layered systems. Ken Fern of Plants For A Future has spent many years investigating suitable perennial plants. Many permaculture designs involve animals. Chickens can be used as a method of weed control and also as a producer of eggs, meat and fertiliser. Agroforestry combines trees with grazing animals. Some projects are critical of the use of animals (see Vegan organic gardening). Animals can be poor converters of energy and require a large land area and large amounts of water for a given amount of food produced. They can also have a dramatic impact on the wildlife of a site. This critique is probably better directed at traditional farming where there is an inefficient uses of animals. Annual monoculture such as a wheatfield can be considered a pattern to be avoided: in terms of space (height is uniform) and time (crops grow at the same rate until harvesting.) During growth and especially after harvesting the system is prone to soil erosion from rain. The field requires a hefty input of fertilisers for growth and machinery for harvesting. The work is more likely to be repetitive, mechanised and rely on fossil fuels. No pattern should be hard and fast and depending on the design considerations they can be broken. An example of this is Broadscale permaculture practiced at Ragmans Lane Farm, which has a component of annual farming. Here the amount of human involvment is a key factor influencing the design. Applying these values to the real world means using fewer non-renewable sources of energy, particularly petroleum based forms of energy. There is general agreement that the pool of available fossil fuels is shrinking, and burning fossil fuels contributes to greenhouse gasses and global warming. However, using less energy is more than just combating global warming. Food production should be a fully renewable system; but using current agricultural systems this is not the case. Industrial agriculture requires large amounts of petroleum, both to run the equipment, and to supply pesticides. Permaculture is in part an attempt to create a renewable system of food production that relies upon minimal amounts of energy. For example permaculture focuses on maximizing the use of trees (agroforestry) and perennial food crops because they make a more efficient and long term use of energy then traditional seasonal crops. A farmer does not have to exert energy every year replanting them, and this frees up that energy to be used somewhere else. Traditional pre-industrial agriculture was labor intensive, industrial agriculture is fossil fuel intensive and permaculture is design and information intensive. Partially permaculture is an attempt to work smarter, not harder; and when possible the energy used should come from renewable sources such as wind power or passive solar designs. A good example of this kind of effecient design is the chicken greenhouse. By attaching the chickenshed to a greenhouse you can reduce the need to heat the greenhouse by fossil fuels, as the chicken's bodies heat the area. The chickens scratching and pecking can be put to good use to clear new land for crops. Their manure can be used to fertilise the soil. Feathers could be used in compost or as a mulch. In a conventional factory situation all these chicken outputs are seen as a waste problem. So in factories cooled by huge air conditioners, the chicken waste is extracted and seen as a problem. All the energy is focused on egg production. Thus it is a further principle of permaculture that "pollution is energy in the wrong place". A basic principle is, therefore to "add value" to existing crops. A permaculture design therefore seeks to provide a wide range of solutions by including its main ethics (see above) as an integral part of the final value-added design. Crucially, it seeks to address problems that include the economic question of how to either make money from growing crops or exchanging crops for labour such as the LETS scheme. Each final design therefore should include economic considerations as well as giving equal weight to maintaining ecological balance, making sure that people working on the project's needs are met and that no one is exploited. One way of doing this is through designing a system that has "multiple outputs" For example, a wheat field interspersed with walnuts will reduce soil erosion, act as a windbreak and provide a walnut crop as well as a wheat crop. As there are two crops to manage the work will be more interesting. Here the system comes into conflict with conventional agriculture and economics. By interplanting trees in wheat fields there is a reduction in the wheat yield. The field is also harder to harvest using machinery, as the operator has to drive around the trees. Most farms specialise in one main crop at a time and seek to maximise surplus in order to increase profit. This surplus can only be maintained with a massive injection of fossil fuels. So, as things stand it is quite hard for a permaculture farm to compete with a "conventional " farm in order to grow basic fruit and veg. This does not mean that there is no possibility of making a living from permaculture systems. For example: jam. Jam is more valuable than strawberries. By doing this and making useful connections, permaculture designs can find niches for themselves in our existing socio-ecomomic structure, but it is unlikely that permaculture designs could produce the flood of fresh produce needed to keep 24 hour hypermarkets stocked with goods. Why is this? Perhaps because as systems become more complex the communities of animals and plants are more likely to balance out and massive surpluses of just one crop are harder to arrive at. There is more likely to be a more constant and varied flow of crops over the course of a year. As food has become cheaper it becomes harder to make a living from growing it on a small scale. In the years since its conception, permaculture has become a successful approach to designing sustainable systems. Its adaptability and emphasis on meeting human needs means that it can be utilized in every climatic and cultural zone. However at the moment the large proportion of practioners are only likely to be inspired individuals and there is a distinct lack of broadscale permaculture projects. Nevertheless, permaculture has also used succesfully as a development tool to help meet the needs of indigenuous communities at risk from exploitation by free market economics. Zimbabwe has sixty schools designed using permaculture, with a national team working within the schools' curriculum development unit. The UN High Commissioner for Refugees (UNHCR) has produced a report on using permaculture in refugee situations after successful use in camps in Southern Africa and Macedonia. The development of permaculture co-founder David Holmgren's home plot at Melliodora, Central Victoria, has been well documented at his website and published in e-book format. The Indonesian Development of Education and Permaculture assisted in disaster releif in Aceh, Indonesia after the 2004 Tsunami. They have also developed Wastewater Gardens a small-scale sewage treatment systems similar to Reedbeds. Robert Hart's forest garden located on the Welsh Borders in Shropshire (the status and future of which, as of December 2005, remains uncertain due to disputes regarding land ownership since Hart's death in 2000). Ragmans Lane, a 60 acre farm in the Forest of Dean in Gloucestershire. Plants for a Future is a vegan-organic project based at Lostwithiel in Cornwall that is reseraching and trialling edible and otherwise useful plant crops for sustainable cultivation. Their online database currently features over 7000 such species that can be grown within the UK. Prickly Nut Woods is a a ten acre woodland near Haslemere, Surrey that is managed by Ben Law. He is using a 'whole system' permacultural approach, utilizing a wide variety of woodland products and documenting a complex web of relationships. He has built a house almost entirely using products from the woodland, which was featured in Channel 4's Grand Designs TV series. Other projects tend to be more community oriented, particularly in urban areas. These include Naturewise, a north London based group who tend a number of forest gardens and allotments as well as running regular permaculture introductory and design courses, and Organiclea, a workers co-operative who are involved in developing local food growing and distribution initiatives around the Walthamstow area of east London. The UK Permaculture Association publishes an extensive directory of other projects and example sites throughout the country.